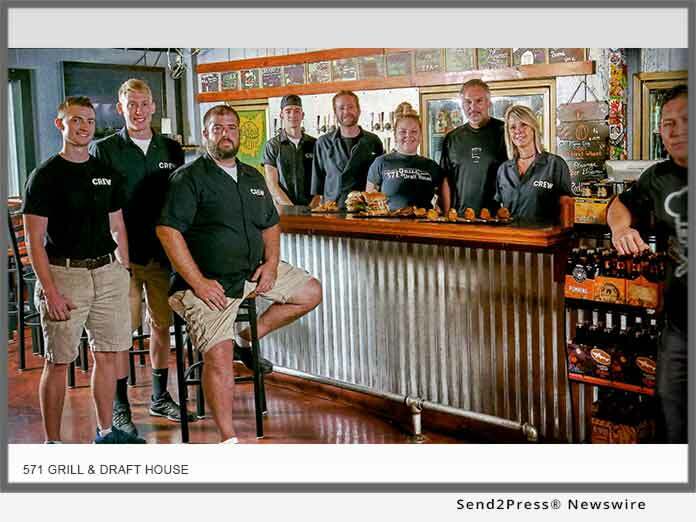 DAYTON, Ohio, Nov 27, 2018 (SEND2PRESS NEWSWIRE) -- The 571 Grill & Draft House in New Carlisle, Ohio has been in business for 18 years and the independently owned restaurant continues to carve out its name in the world of gastro pubs and draft houses. While some restaurant owners may sit on their laurels after what seemed to be an instant success with residents living north of Dayton, the owners of 571 Grill understand that you must either go big or go home. "We have never taken our reputation for granted," Tim Juday, co-owner of the 571 Grill & Draft House, says. "Our kitchen staff is always working on new innovative creations, while our front-of-house employees are constantly training to provide higher levels of customer service." And, all those efforts continue pay off. Year after year, this Midwest establishment manages to top "best of" lists in multiple categories. For instance, just last year, it made the, "The 6 Best Places to Grab a Burger in the Midwest" and just in October, the 571 Grill & Draft House found its way as a featured establishment in the Gordon Food Service publication Next Course in its article "More than another Roadside Attraction" while in 2016 the restaurant's most favored menu items were recognized by Dayton.com in "4 Delicious Burgers that are Worth the Drive." "Personally, I would have a hard time arguing against a craft beer when eating one of our featured burgers," says Juday "our locally sourced menu items have so much flavor packed into them, that any less bold of a beverage doesn't do them justice." "We couldn't be more pleased that our brand continues to get such positive recognition - year after year. And who knows what's in store for us next?' Let's see what happens," Juday says.